If you’re tired of roasting your turkey every year and want to try frying it, it is advisable to steer clear of propane powered turkey fryers unless you’re already comfortable with using them, as they come with considerable safety risks. An electric one is infinitely safer and has the added advantage of being good to use indoors as well as outdoors. 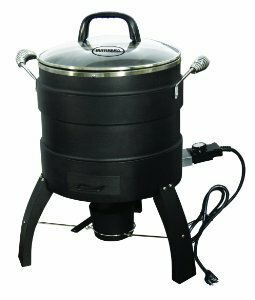 The best indoor turkey fryer should have enough room inside for your turkey to be fully covered with the oil circulating properly. It should also be powerful enough to keep the oil at a high enough temperature. We’ve selected the best electric turkey fryer options available on the market, but if you’re still on the fence as to whether you really need a turkey fryer, maybe the following points will help you decide. First of all, a turkey fryer is not used just for turkeys and it doesn’t necessarily have to be used for frying only. You can fry up chicken, corndogs, fries and doughnuts and you can use it to boil or steam seafood and vegetables. In fact, it is an excellent way to cook crab! While frying up all this, you free up your oven for other dishes, like baking a cake or roasting veggies. Of course, if you prefer only roasting your turkey but without taking up hours of oven use, you could look at getting an electric turkey roaster or an indoor rotisserie instead. There are, however, some benefits with frying your turkey that you don’t get with roasting. The biggest one is that it’s a lot faster and you can actually cook a whole turkey in about an hour. Roasting a turkey also means frequent basting to get a nice and tasty dish. Frying doesn’t need this and at the most you can do a few flavor injections and/or a dry rub before putting it in. You’ll get a crispy skin with tender and juicy meat inside. The next consideration is whether to choose an outdoor propane fryer or an indoor electric one. A propane fryer has to be used only outside, as there is always a risk of the open flame catching fire if the hot oil splashes out. If you have inclement weather you can still fry a turkey indoors with an electric one. The final advantage is that you use less oil in an electric one and therefore you waste less. The disadvantage of an electric fryer is that the maximum temperature can’t match that of a propane one, so the skin may not turn out as crispy. The maximum oil fill line marked on the fryer may not be enough to fully cover the turkey and there is sometimes not enough room for the oil to properly circulate around it. To circumvent this problem, you would have to buy a smaller turkey than the size specified as the maximum by the brand for that model of fryer. Lastly, you have to keep the lid on an electric fryer while it’s frying, so steam builds up inside and doesn’t allow the skin to become that crispy. On the flip side, this means that the insides of the bird will be really juicy! Now that you have a better idea of the pros and cons, the following indoor turkey fryer reviews should help you figure out which one is best for your needs. Look at more electric turkey fryers available on Amazon. The Masterbuilt Butterball Indoor Turkey Fryer is one of the most popular fryers out there. It is relatively easy to use, there are two sizes, a large and an X-large and it is even endorsed by the Butterball Turkey company. Plus, the large sized fryer is the least expensive unit on this list. Both sizes have standard features like an oil drain valve, a cooking basket with its own drain clip so you can easily lower and raise the bird into and out of the hot oil without burning yourself. An analog thermostat control dial and indicator lights let you know when the power is on and the oil is ready. They are even certified safe for counter top cooking, so you can fry up a turkey virtually anywhere. The large sized fryer will cook up to a 14 pound bird while the extra large fryer will hold a 20 pound turkey. The 1650 watt heating element heats up the oil up to 375°F (2 to 3 gallons are recommended) in about 30 to 40 minutes depending on how much oil is used, and will cook a full turkey at about 4 minutes per pound. An auto shutoff safety feature prevents the oil from getting dangerously hot. If you want to cook something else for a second time, they will take 20-30 minutes to get back up to the right temperature. Just remember, as with all electric turkey fryers, they are not as fast as outdoor propane fryers, but they are still faster than roasting in an oven and are far safer to use. With the outer stainless steel construction and porcelain-coated inner cooking pot, there is very little chance of the oil boiling over. These also use up about 33% less oil than standard fryers. If we were to pick a best bang for the buck unit, both of these Masterbuilt Fryers, the large and the extra large, would be the winners. For price versus performance, these come in 1st. This is about as close to a commercial turkey fryer that you’ll find, it’s the most expensive and powerful unit here at 1800 watts, and the Waring Pro Turkey Fryer is going to make your turkey delectable every time you use it. The cooking adjustment and timer dials are on top and easy to get at, making this one of the easiest units to use on this list, and it has an oil valve for ease of draining. It fries very fast at just over 3 minutes per pound and you can set the timer to go up to 120 minutes. It will fit an 18 pound bird while holding 2.5 gallons of oil and the lid is vented so that the food inside doesn’t steam instead of fry. Better still, it uses a rotisserie action which rotates inside so you’ll only use half the oil of other fryers and the movement ensures that the whole turkey gets cooked. In that respect, it saves you money every time you fry a turkey. If you want to fry smaller things, there’s a fryer basket that can hold up to 8 lbs of food and it can also be used as a steamer for such things as corn, clams and crabs. It’s heavy at nearly 30 pounds dry, so once loaded up with oil and turkey, it isn’t going anywhere, which makes it incredibly solid and sturdy sitting on a counter or table but a bit problematic for storage. Another problem you might have is that the cord is quite short and you can’t use an extension cord, so find the right space in your kitchen where the power point is very close. Perhaps the best thing about the Waring Pro Rotisserie Fryer is that it comes with a 5 year limited warranty which is the best on this list. If you are looking for the best functional and most versatile of the turkey fryers here, and are willing to pay for it, the Waring Pro TF200B Turkey Fryer/Steamer is the way to go. If you do not want to use gallons of oil to fry a turkey, but want the same taste and results, your only alternative is the Masterbuilt Butterball Oil-Free Turkey Fryer and Roaster. Although the word “fryer” is in the name, the truth of the matter is that this is really a very effective roaster that uses radiant heat to seal in and crisp up the skin almost like a fryer would. Instead of laying the bird directly into a basket, there is a stand that holds the bird vertically and is then placed into the cone shaped basket. At 1650 watts, it will cook up to an 18 pound bird, but it will also take 10 minutes per pound to cook. That makes this unit the slowest cooker here and because there is no oil, it needs about an hour of preheating time before the inside is ready to go. You could almost think of this as a turkey oven because that is really what it is. It comes with a wood chip pot at the bottom to infuse a smoky wood flavor with your choice of wood chips, if you so desire, and realistically, whatever you would cook in a traditional roaster, you could also cook in here as well. In order to get a crisper skin as close to the kind you get when frying, you could rub the turkey with a bit of oil. Add a dry rub too if you like. There is a removable drip tray at the bottom to catch the drippings as the bird cooks so you can use that delicious goodness to cook vegetables, etc. It is endorsed by Butterball, so this is really a quality unit overall. The results will be as good as cooking in oil without any added fat, and no added fat is what makes the Masterbuilt Oil-Free Turkey Fryer and Roaster so appealing. The Chard EDF-15 Electric Turkey Fryer looks like a traditional propane fryer without using gas for heat. The top mounted temperature and timer dials are easy to turn and use, and this is the only unit with a see-through glass lid. That’s quite handy. This is essentially a beefed up electric deep fryer that will take up to an 18 pound bird and it will cook it in about 5 minutes per pound. You’ll need 4 gallons of oil to fill it, and expect about 30 minutes or so to heat up the oil. You can also use this for a low country boil or for steaming food. Unlike the other oil turkey fryers on this list, the Chard has no oil drain spigot. You will literally have to dump the oil from the fryer by tipping it over or you can use an inexpensive oil pump. Now, 5 pounds of oil weighs about 25 to 30 pounds, and couple that with the weight of the unit itself, which is nearly 20 pounds, and you’ll have to be extremely careful. Never dump the oil when it is hot. That could lead to a very bad accident. It comes with a break away magnetic cord, which is a terrific safety feature especially if you have kids. Better that the cord breaks loose than the hot oil in the fryer spills all over. That feature alone makes it the safest hot oil unit here. It is the second least expensive oil fryer on this list, and if you like the style and the break away cord safety aspect, this is certainly a fryer to consider.